The information below on scholarships and financial aid awards at Drew University applies to undergraduate students entering Drew for the first time in fall 2018 or later. Drew offers three significant, merit-based academic scholarships for students enrolling in the 2018-2019 academic year. All applicants will be considered for these awards and no additional application is required. Applicants to Drew from high school will be considered for one of three major scholarships at Drew: The Francis Asbury Scholarship, The Presidential Scholarship and The Dean’s Scholarship. These scholarships are awarded at the time of admission, do not require a separate application and are based on the applicant’s grades in academic classes, the strength of the applicant’s curriculum and on the applicant’s best standardized test scores (not required for the Dean’s Scholarship). Annual scholarship amounts range from $5,000 to $20,000 and are renewable at the initial amount awarded, assuming no major changes in college tuition charges and contingent on the maintenance of satisfactory academic progress. International students are automatically considered for all Drew University Academic Scholarships at the time of admission. There are also a limited number of need-based grants and student employment opportunities available for international students. For consideration, students must complete the International Student Financial Aid Application and submit it by Feb. 15 to the Office of Financial Assistance. International students must submit their Certification of Finances at the time of application. Transfer applicants will be considered for one of three major scholarships at Drew: The Francis Asbury Scholarship, The Presidential Scholarship and The Dean’s Scholarship. A minimum GPA of 3.25 in a solid academic curriculum over at least two semesters is required for consideration. Annual scholarship amounts range from $5,000 to $20,000 and are renewable for up to two additional years at the initial amount awarded, assuming no major changes in college tuition charges and contingent on the maintenance of satisfactory academic progress. Students who are awarded the Francis Asbury Scholarship with an SAT score of at least 1300 and an ACT score of at least 29 and who indicate on the application for admission that they would like to be considered for the Baldwin Honors Program may receive an invitation to participate in the Baldwin Honors Program upon admission to Drew. They will also receive an additional annual scholarship of $1500. Students may retain their Baldwin Honors Scholarship by maintaining a GPA of 3.5 or higher and must remain active in the Baldwin Honors curriculum. Students who have demonstrated a sustained commitment to community service and civic engagement throughout their high school years are eligible to apply for a Civic Engagement Scholarship. Applicants should demonstrate leadership in organizing and implementing community projects, as well as working with people from diverse backgrounds. Students who are awarded the Civic Engagement Scholarship receive an annual award of $1,500 ($6,000 over four years). Baldwin Honors, Presidential or Dean’s Scholars who are also awarded a Civic Engagement Scholarship receive that amount in addition to their academic scholarship. Civic Engagement Scholarship recipients are required to join the Civic Scholars Program, which includes participation in special classes, workshops, seminars and off-campus service projects. Residential Civic Scholars live together in a living-learning community for the first year of the program. New for fall 2019, a global engagement option will join our current community-focused program, expanding the reach and impact of Civic Scholars. Students must be must be in good academic standing, enrolled in 12 or more credits each semester and continue to be an active participant in the Civic Engagement program in order to remain eligible for this scholarship. Fourth-year students in their last semester may register for fewer credits, in which case the scholarship will be prorated to the number of enrolled credits. Priority application deadline for Civic Engagement Scholarship is Feb. 1. Early Decision and Early Action candidates are encouraged to submit their scholarship applications as soon after the admissions application as possible. Applicants for admission with a demonstrated talent for and interest in the fine or performing arts (art, theatre and music) are encouraged to apply for the Drew Scholarship in the Arts. Students awarded the Scholarship in the Arts receive an annual award of $1,000 ($4,000 over four years). This award is in addition to any academic merit awards received. While Scholarship in the Arts recipients are not required to major in an arts field, they are expected to participate in the fine or performing arts throughout their college career. Students must be in good academic standing, enrolled in 12 or more credits each semester and continue to be an active participant in the arts in order to remain eligible for this scholarship. Priority application deadline for the Scholarship in the Arts is Feb. 1. Early Decision and Early Action candidates are encouraged to submit their scholarship applications as soon after the admissions application as possible. While at Drew, the seven-year combined degree student will receive our top merit scholarship worth $20,000 per year for three years and the BA/MD Scholarship worth $15,000 a year for three years, for a total award of $35,000 per year. Additional financial aid for the three years at Drew is available based on demonstrated financial need by filing the Free Application for Federal Student Aid (FAFSA). Drew is committed to helping students and families afford quality higher education. In order to be considered for need-based grants from Drew University, students must complete the Free Application for Federal Student Aid (FAFSA). The FAFSA may be completed anytime after Jan. 1. Drew’s priority deadline for filing the FAFSA for new students is Feb. 15.
International students are automatically considered for all Drew University Academic Scholarships at the time of admission. There are also a limited number of need-based grants and student employment opportunities available for international students. For consideration, students must complete the International Student Financial Aid Application and submit it by February 15 to the Office of Financial Assistance at finaid@drew.edu or 973-408-3188 (fax). In addition to scholarships and grants offered by Drew University, students may apply for scholarships offered through outside organizations. Outside awards will be used to meet any unmet need in the financial aid package. Once need has been fully met, an adjustment may be made to the self-help portion (work-study and loans) of the package based on federal and state regulations. Drew University need-based grants will be reduced only if the total of all scholarships and grants exceeds the student’s financial need. Outside awards will have no impact on Drew University merit-based scholarships unless the total of all grants and scholarships exceeds the cost of attendance. A micro-scholarship is an amount of money—up to $40,000!—that students can earn based on specific achievements made in grades 9-12. Drew partners with raise.me to offer micro-scholarships that recognize your everyday achievements. You can accumulate up to $10,000 per year, which will be included in any Drew scholarship or grant that you may be awarded. Drew University has a partnership arrangement with Seton Hall University for student membership in the Army Reserve Officer Training Corps (ROTC). Seton Hall, located in South Orange, NJ, is 12 miles from Drew. Most students make the 20-minute drive two days a week with either their own car, a Zipcar or with a fellow student. Army ROTC is a leadership program that allows cadets to both attend college as a regular student and train to commission as an officer in the U.S. Army upon graduation. A number of opportunities are available to prospective cadets to receive a full scholarship from the Army. The Pirate Battalion at Seton Hall is one of three host universities in the state of New Jersey for Army ROTC. This ROTC program encompasses other crosstown universities—including Drew—that contribute to the 100-strong Battalion of Cadets. Purpose: The ROTC program seeks to attract qualified, motivated students who are committed to learn Army values and standards. Cadets will be trained on Army operations and coached to become leaders of soldiers. They will be mentored to improve leadership skills, qualities and traits for betterment of our community. Finally, the ROTC program at Drew through Seton Hall will commission Army officers of character who lead our Army and nation to good world standing. Four-Year Scholarship: Full tuition, book allowance, and a monthly stipend are offered to current high school students who intend to enroll in a four-year degree program at a participating ROTC college. Deadline: All applications must be received no later than January 10 of your senior year in high school. Application requirements: You must be a U.S. citizen between the ages of 17 and 26 with a minimum cumulative high school GPA of 2.50. Receive a high school diploma or pass a high school equivalency test. Minimum of 920 on the SAT or 19 on the ACT. Pass the Army Physical Fitness Test Service. Commitment: A total of eight years split between the Army and the Individual Ready Reserve. Three-Year Scholarship: Full tuition, book allowance, and a monthly stipend for current college students who still have three years to complete their degree programs at participating ROTC colleges. Deadline: Unpublished; speak to a recruiting officer for timeframes. Application requirements: See the four-year scholarship requirements listed above. Service commitment: Four years of full-time service. Two-Year Scholarship: Full tuition, fee coverage, book allowance and a monthly stipend for current college students who still have two years to complete their degree programs at participating ROTC colleges. Deadline: Unpublished; speak to a recruiting officer for time frames. The Higher Education Student Assistance Authority Tuition Aid Grants (TAG) is a state-funded program which provides assistance to students who demonstrate substantial financial need. Have a U.S. diploma or equivalent. Are enrolled, full-time, matriculated undergraduate students. Are legal residents of New Jersey for a minimum of 12 months prior to receiving a grant. Cannot be in default on a student loan or owe a refund on any student grant. Are registered for the Selective Service (males only). Returning students: April 15. If you do not file by this deadline you will lose grant eligibility for both the fall and the spring. New students in the fall and spring: September 15. New students in the spring only: February 15. For more information, contact the Higher Education Student Assistance Authority Scholarships and Grants program at 800-792-8670 or visit www.hesaa.org. $2,500 per year, depending on a student’s financial need and satisfactory academic progress. Contact Drew’s Educational Opportunity Scholars Program Director. Residents of other states should check with the appropriate state agency or high school guidance office for additional details regarding state grant eligibility and application requirements. Any state grant award is tentative and contingent upon the finalization of the state grant formula appropriation and actual receipt of funds by Drew University. Pell Grants are funded by the federal government and eligibility is determined by the information provided on the FAFSA. The amount of this grant ranges from $606 to $5,920 annually for 2017–2018 and is directly related to the EFC calculation determined by FAFSA data. This program has a 12-term limit. File the entire FAFSA by Feb. 15. FSEOG is a program funded by the federal government. 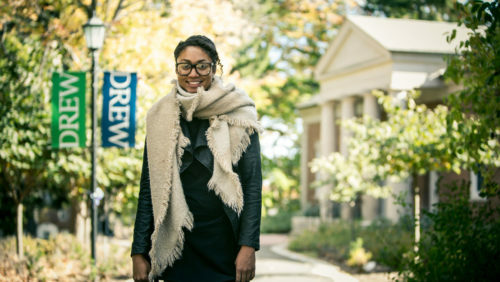 Drew University is given a fixed amount annually to award to the students with the lowest Expected Family Contribution (EFC) as determined by the FAFSA data. A typical FSEOG award is $1,000. • Drew will provide an estimated $32 million in scholarships and grants to students in 2018–19. • Eighty percent of Drew students receive scholarships and grants from the University. • The average federal loan debt of Drew graduates is below the national average of $29,000.